HOW WIDE ARE RAILROAD TRACKS ANYWAY? Glad you asked. The real answer involves horses. Stay with me, okay? After the Civil War, the Congress declared that all new railroad tracks had to be a standard 4-foot, 8 and one half -inches. Before that time there were not so many rail roads and the track sizes were all different sizes all over the place, whatever each rail company wanted, it did without measure of any other rail company. Standardizing is of course a good idea, but why the odd number? If you can pick any size why pick 4 foot 8 and a half inches? For a start – because the English made them that way, and English ex-patriots built our railroads. Fine, but why did the English build track that size? Well… Because the Romans did, not rail track, of course, but they did build roads, and the wheels on their chariots cut ruts into the stone roadway and if your cart wasn’t that size you had a really rough ride going in and out of the ruts. This forced everyone after them to make wagons the same size. Four feet, eight and a half inches between wheels- because in ancient Rome that was the size of their war wagon wheels and that was determined because it was the width of the back end of two war horses harnessed together. Someone way back then had decided that the wagon should not be any wider than the horses so they could go through the same openings. Time has a way of carrying its’ ideas forward so … it gets better. You know those huge booster rockets on the space shuttle? Engineers wanted to make them fatter, but they couldn’t because they had to be shipped by train and had to fit through a tunnel. Tunnels are only slightly wider than rail cars that run on the tracks, you know 4 foot 8 and a half inches, which means this: engineers had to design a sophisticated rocket capable of thrusting a shuttle and people into orbit to go to the moon…but they also had to honor how wide a horse’s rear is, times two, because they shipped parts of the shuttle by rail cars which had to go through tunnels and gateways. Rail cars are, however, wider than 4 foot 8 one half inches; some can carry 12 foot wide cargo on special carriers, but is generally limited to 10 foot wide carriers. This limits the size of rail cargo in many areas and limited the size of the booster rockets. Keep in mind that many of today’s horses are much larger than the ancient Roman version and if they had them would we would have had bigger boosters? Not really the point of this story. Don’t you wonder how much of our daily life is run in a rut? I heard once that a rut is a grave with both ends knocked out, but sometimes it is good to have something to keep you on track as well and often it leads to someplace or some way that is worthy of going. Ruts are not all bad but I can’t help think that without some ruts we missed a lot of roast and we could have boosted more cargo to the moon, too! I got into a rut of not posting often and now I think I’m out of that groove! Thanks for reading on my blog. 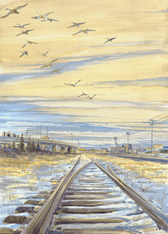 This entry was posted in BLOG--One Page True Tales, HOME and tagged getting in a rut, Railroad tracks on August 24, 2015 by eightdecades. I love your roast story, my grandmother did that to have the roast fit in the iron skillet she cooked it in LOLs…I had never thought of the reason…. The side walls of my rut were quite high, but I could still see the sky and kept moving supposing I was still grooving and remaining quite willing to try. For all of our sorrows we must trust tomorrows. as each new moment goes by. Thank you so much, I have missed you and your poetry as well. That is an amazing story John. And yes, I would believe the ruts we follow in life, we do like to follow what’s safe, secure and in our comfort zones. Thank you for responding, It took me a year to un-rut my not blogging and getting comfortable with not doing it.So now I must get back to why I started blogging in the first place! Great story of how traditions are carried forward without understanding why things are done the way they are. Thanks for the laugh. 🙂 I’m glad to see a new post from you! You were missed. Maybe I can get some of my railroad stories posted now. Or Roast beef stories! Thank you, and yes I have been so behind in posting, some setbacks now resolved and now forward again.